I have reviewed the Fireye Mini from FireStone Audio a while ago and now an updated version has come out. The Mini+ keeps to the ultra-portable size while adding in a few more very useful features and mending some of its predecessor’s shortcomings. Amplifier Structure: Class-AB, coupling capacitor-less. Usage Time: With 100% full battery around 12hrs. 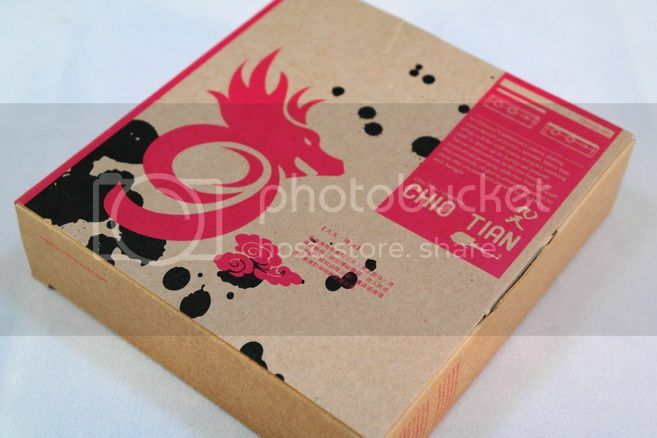 Compared to the original Mini, the Mini+ comes really well packed - and since this seems to be a joint project with the Taiwan based performing art group ‘Chio Tian’ (= ‘9 Sky’), it also take on a very Chinese traditional + fusion styling. 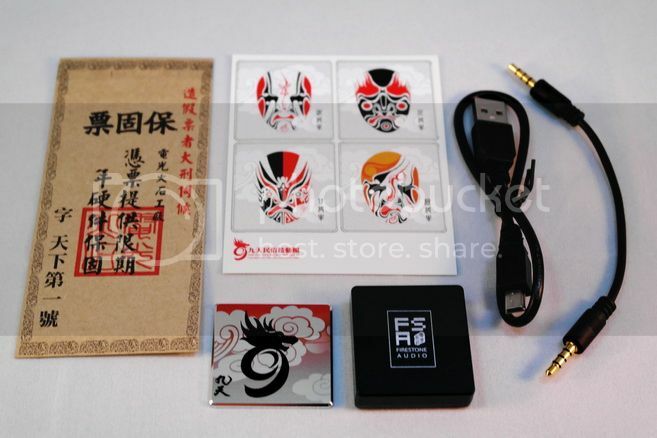 The removable aluminum face plate has the ‘9 Sky’ dragon logo and there are some stickers with Chinese opera facial printing. For actual accessories, you’ll get the USB charging cable as well as a TRRS interconnecting cable. As always, FireStone has maintained a good level of build quality. While it might not be functionally useful, the face plate does add a sense of class and uniqueness onto the little amp. It is so well made that, even though it does not have not any clamping nor double taped on the inside, it stays on the amp and never once falls out by its own. The amp itself has no power switch and instead turns on automatically once the headphone-out is plugged in (and power down vice versa). The only switch on the amp is for the bass boost. Size wise, the Mini+ is about 60% larger than the original Mini. 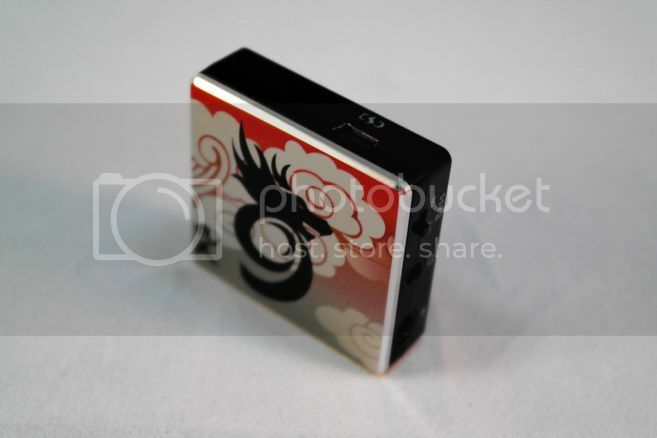 Still it is fairly small, about the same footprint as FiiO E6 but 2mm thicker and well within the realm of ultra-portable. A big plus on the Mini+ is that it supports mic + remote pass-through. This means you can still receive call with a headset on the Mini+ when it is paired with cellphone, or control volume with a headset’s remote with Mini+ on an iDevice. That’s a very handy function to have. Mini+ has a fairly modest fixed gain of +6dB, which is the same as the Mini. 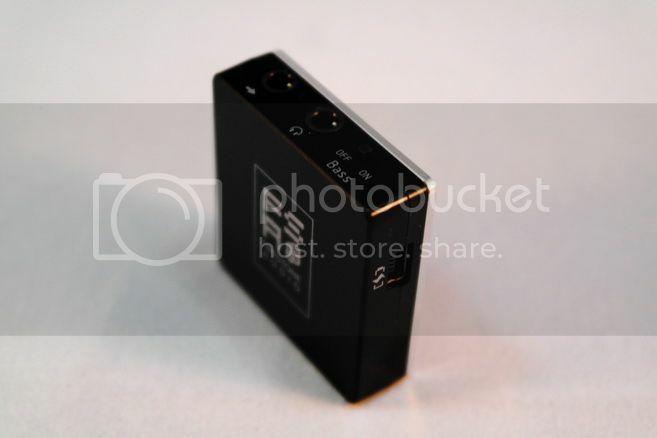 If you hear any hiss on the Mini+, a good chance is that it is coming from the source as Mini+ is pretty much hiss free on its own but has the tendency to pick up hiss from the source. For example, my Xepria TX is kind of hissy with the Mini+ while Nano 7G is fairly quiet. To avoid hiss, the best thing to do is probably not to use hiss prone IEM, given you might not have a choice on the source. There is some mild EMI with the Mini+, but not enough to be a major concern. This is where Mini+ takes a dip from the 24hrs of the original Mini to the current 12hrs. While it is indeed half the playing time, the gain of overall performance, which will be discussed later, does warrant the cost. So read on. 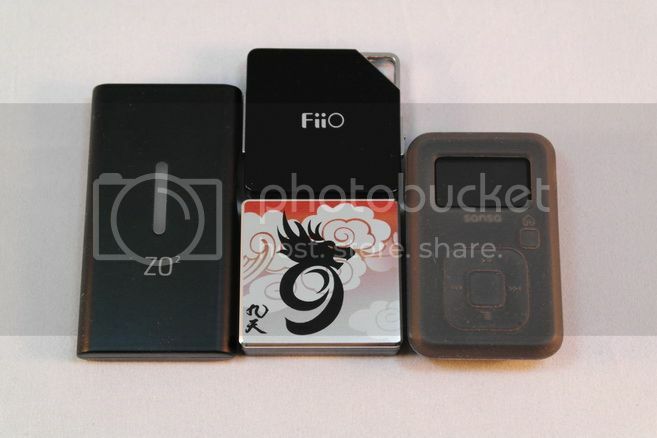 Size comparison (from left): digiZoid ZO2.3, FiiO E6, Mini+, Sandisk Sansa Clip+. A few more fun facts about the Mini+: instead of the TI’s DRV601 on the Mini, FireStone went with the MAX9722A this time. 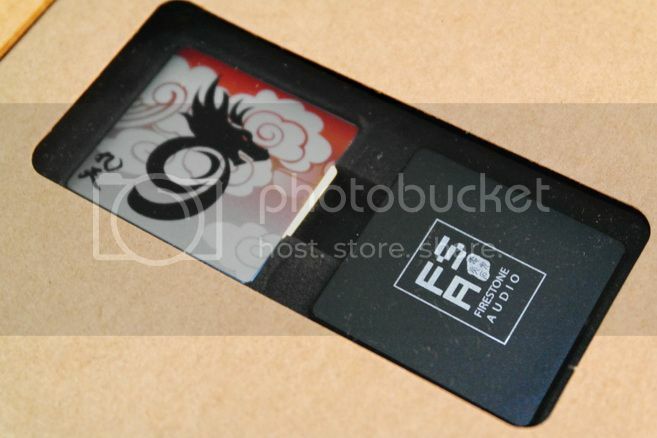 It is actually the same chip found on FireStone own Fireye HA, if I am not mistaken. I have seen this chip on a few portable amps now and it can go from fairly decent to really good, depends on the implementation. The RMAA measurement on the Mini+ is surprisingly good. Not the greatest, but really looks clean and distortion free, which is not always the case when it comes to volume-control-less, fixed volume boosting type of ultra-portable. Frequency response is flat from 20Hz to 20kHz – another improvement from Mini’s slightly roll-off bass. The output impedance is measured and calculated at 0.45ohm, which is a major improvement over the Mini’s 10ohm. Current output is quite good as well. 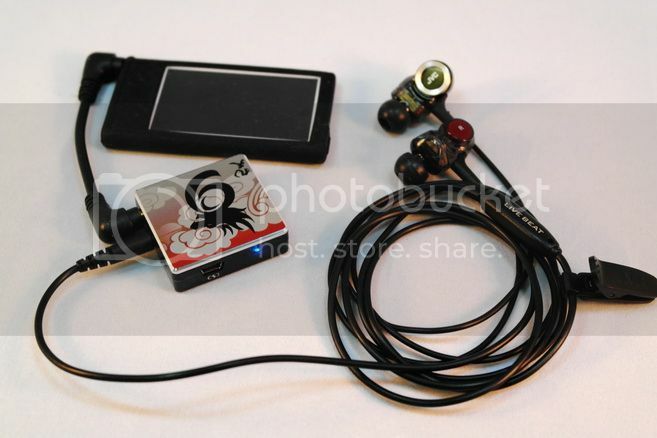 Not the highest but far better than Mini and even comparable to many small portable amps. Overall, I’ll say the Mini+ is very solid as far as measurement goes. Subjectively, the Mini+ doesn’t disappoint as well. As I have said on the original Mini – beside weaker bass, it compares quite well over FiiO E6 and digiZoid ZO2.3 and very close to what a mid-fi portable amp will sound like. The Mini+ really further improves upon it with a wider soundstage and an even more neutral and transparent presentation, which brings out more detail because of the improvement separation and cleaner positioning. Among the sub-$100 portable amp, I won’t say the Mini+ is able to compete head-to-head with the maxed out 18V Fred_fred_2004’s 3 Channels Headphone Amp just yet, but it is ready to level the playfield with a stock JDS Labs’ cmoyBB. Given the two are priced similarly and cmoyBB has been long regarded as an excellent sub-$100 portable amp of its own right, I’ll say the Mini+ is doing quite good as well. In exchange of a roll-able opamp, an independent volume control and more DIY’ish appearance of the cmoyBB, you get instead a smaller, more streamline package with mic+remote support of roughly the same sound quality. Those who use smartphone as their main source of music will definitely appreciate the Mini+ more. The bass boost implementation on the Mini+ is almost identical to that of Fireye HD as the FR curve measured very similarly on both. FireStone Audio claims a +3dB boost @ 130Hz but as you can see, it is really more of a +4.5dB @ 130Hz and peak to almost +6dB under 50Hz. 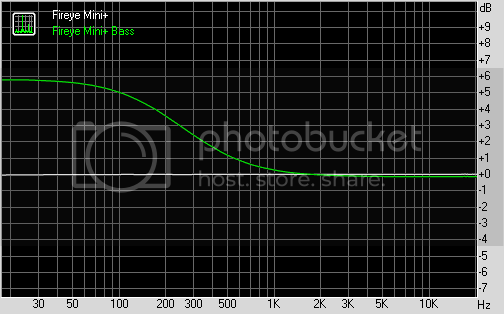 I bet FireStone Audio just center their FR curve around 500Hz as I usually center my graph near 1kHz. So essentially we are both right, but different in how we describe the same thing. Overall the bass boost is quite solid and adds to the weight of bass hit without being overpowering. Mini+, between Nano 7G and JVC HA-FXZ200. It seems FireStone Audio has taken the lesson they have learned on the original Mini and applied it to the design of the Mini+. As much as you might think the Mini+ is more like a volume booster than a proper audiophile portable amp, it is nonetheless a fairly well rounded piece of audio gear. Among all the no-volume-control ultra-portable I have reviewed so far, beside the WoodWind which is still in development, Mini+ definitely comes the closest on blending small size, respectable spec and good sound quality into one device. This is quite a winner. A thank to FireStone Audio for the sample.